Vieux sujet que je remonte pour faire partager mon expérience relative au boîtier HDPLEX H3 (version SODD), que j’ai choisi, après de longues réflexions. 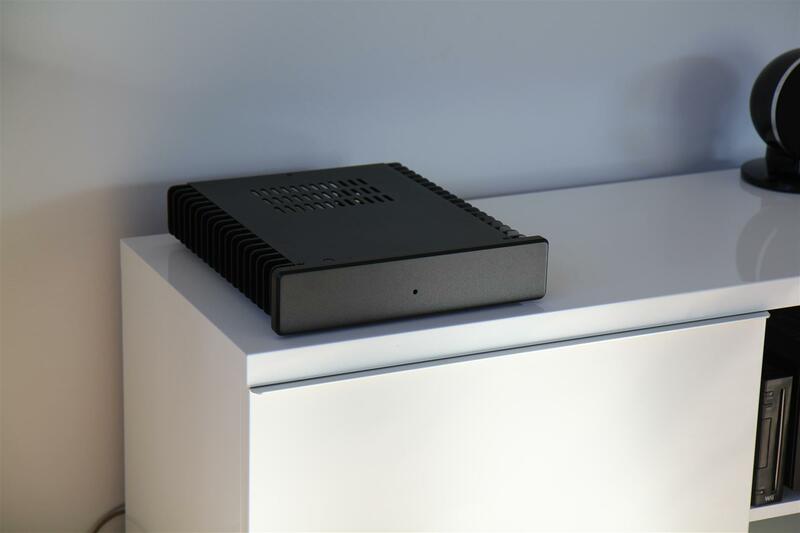 Fanless, le silence, le silence ! Je suis parti voir du côté de Streacom (FC8), chez Silverstone (GD04) mais après avoir lu le test sur Silentpcreview, comparé et recomparé, je suis finalement passé sur hdplex (un peu plus de place, un. Reste à faire : un lecteur slot-in blu-ray, sachant que la lecture blu-ray sous linux, ce n’est pas encore vraiment ça, et un stockage plus conséquent (soit en interne avec un 2,5′ ou un NAS). Verdict ? un silence d’or, un très bon boîtier, pas trop difficile à monter (pour un maladroit comme moi), une télécommande qui ne réagit pas toujours bien (je ne sais pas encore si c’est la télécommande ou le récepteur). Mais globalement, une vraie satisfaction. Un silence de cathédrale et avec openelec, c’est un vrai bonheur ! 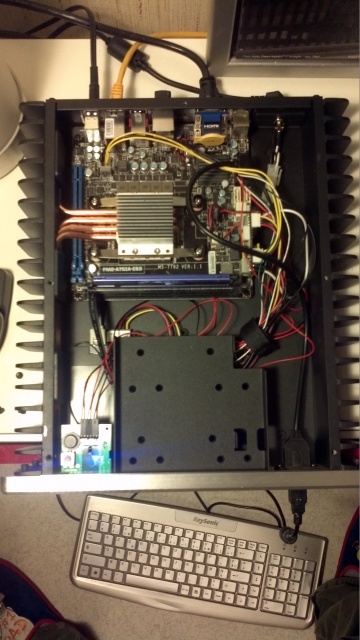 Finally assembled my H3.S fanless PC system with AMD APU, with remote control and 80w internal psu. 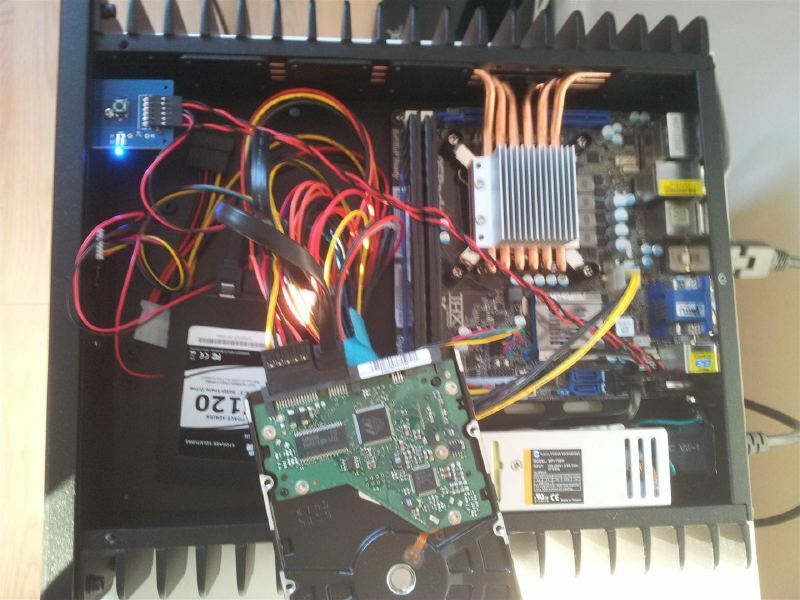 Used Gigabyte A 75N motherboard, A6-3500 cpu, 2x2gb 2000mhz corsair vengeance ram, 60 gb patriot pyro ssd. 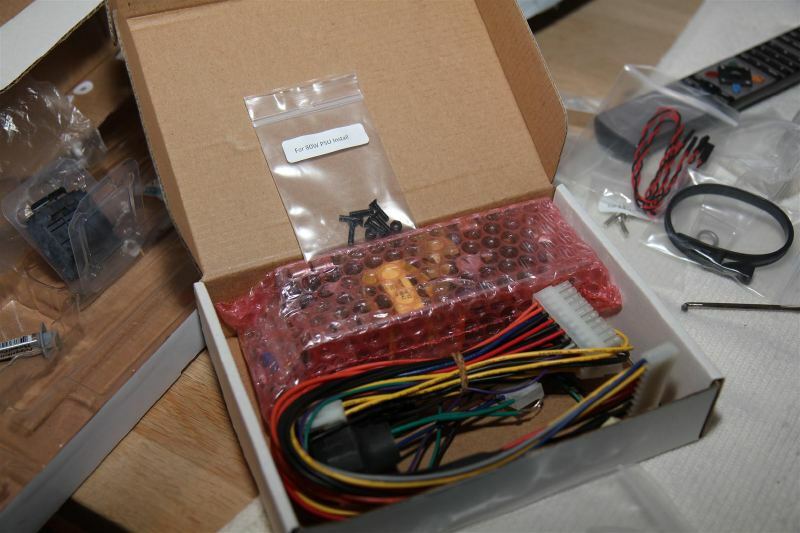 Assembly went smoothly – manual is great, all parts necessary for assembly were in box. There was small problem with ssd – managed to fix it with only 2 screws, but don’t care about that it’s ssd after all, no moving parts :). I was worried about psu- on sticker there is info that with passive cooling max output should not exceed 60w, but it was ok – there were no problems during win7 install at stock voltages, temps were around 50oC during installation of windows with 4 heat pipes (2 did not fit, as it was written in manual, cpu cooler fixing screws are obstacles). To reduce heat further I undervolted cpu and did not push ram to 1866mhz (stripped off cooler plates from ram, they were sticking out of case). 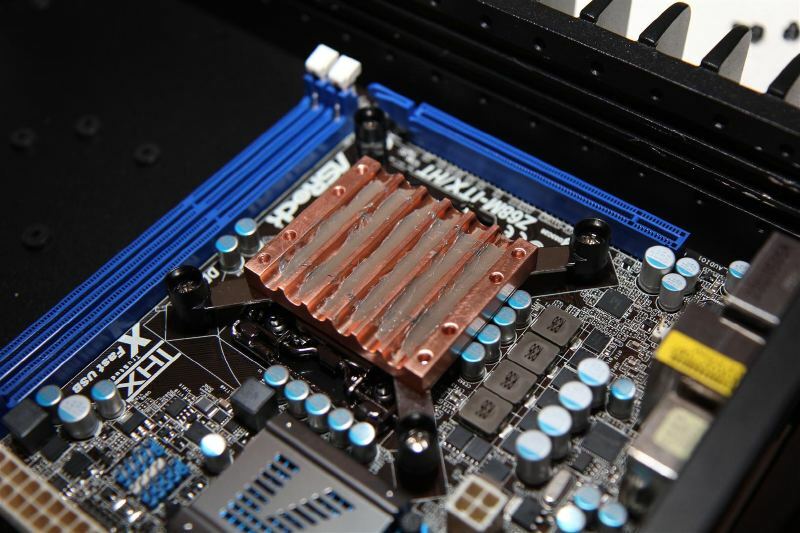 Might do it in future, but I am not sure how well ram sticks will handle extreme frequencies without cooling. 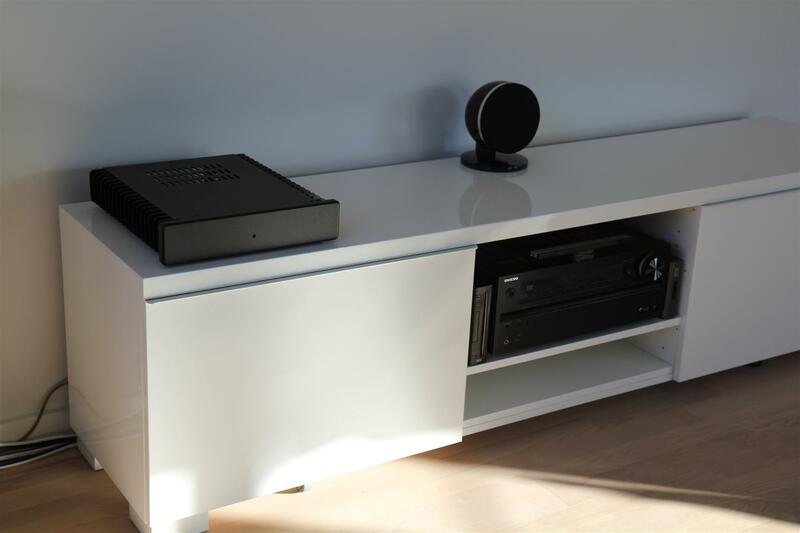 I am very happy with that project – result is total silence and enough power to watch bluray3d on plasma hdtv – it is all I need from my htpc. Finally got my last component in yesterday, so here is the end result. 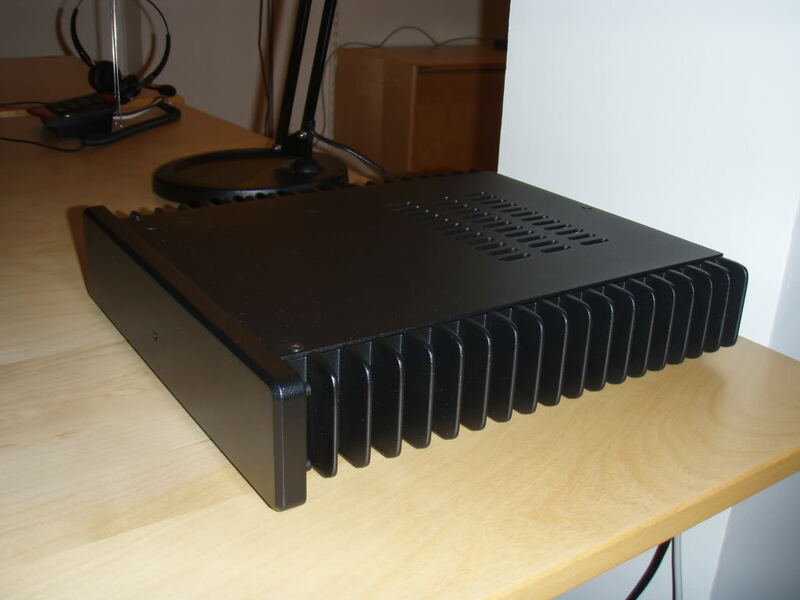 My objective was to build a new HTPC that would act as a client for SageTV. This has become more important since SageTV stopped selling their extenders – they have also stopped selling client licenses but I have a spare client license and there is a hope that they will make client licenses free at some time in the future. I also wanted the PC to be able to play Netflix and other online services and I may use it for other media player UIs like Plex or XBMC. 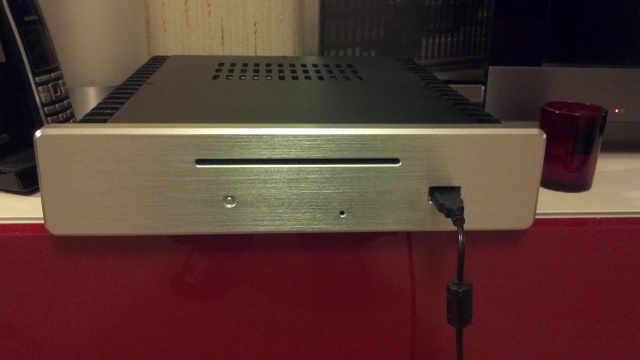 As a proof of concept I wanted to try to make a totally silent HTPC. SSDs have started to become more prevalent so that way easy – the harder sound sources to eliminate are the fans in the case, power supply and CPU cooler. The build of this PC encountered a problem right of the bat. 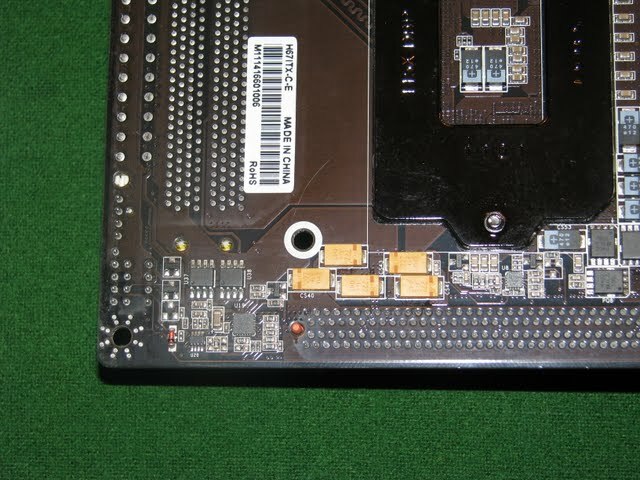 The motherboard had some surface mount components (see photo below) that interefered with a plastic screw holder that goes on the underside of the mobo that holds the CPU copper block in place – these screwholders have a diameter larger than the white circles on the mobo. I had to take a dremel and trim this piece of plastic so that it no longer sat on the component. 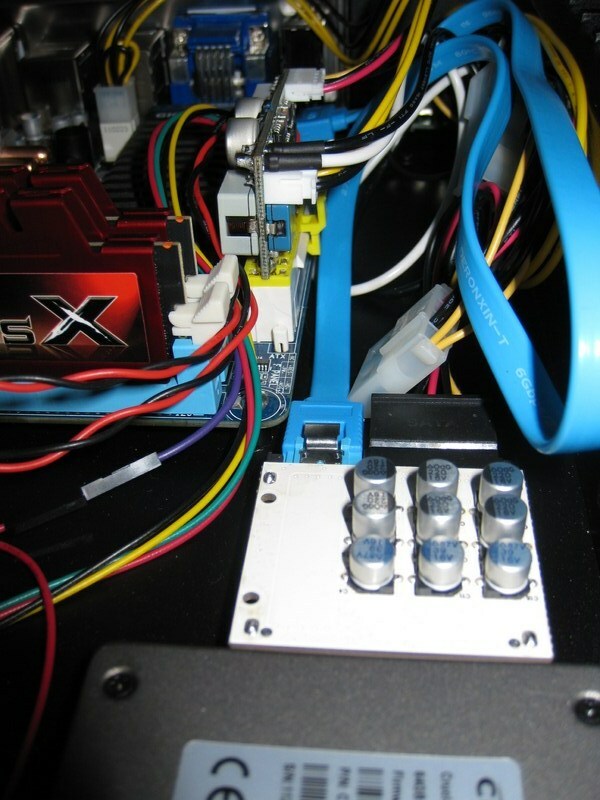 It seems that this problem is not unique to this mobo as others have had the same problem with other mobos. The rest of the build was very straightforward although it is rather tight in the case to screw in pieces like the power plug holder. The case has enough room for a 3.5″ hard drive – which I don’t requrire so this case has lots of empty space for my purposes. 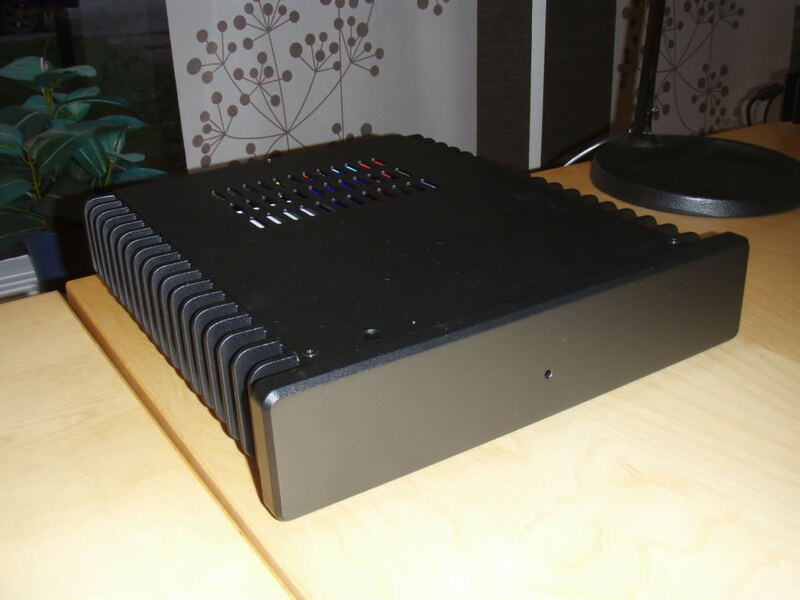 In an ideal world HD Plex would make a similar case that is quite a bit smaller – big enough to fit an ITX mobo and not much else. 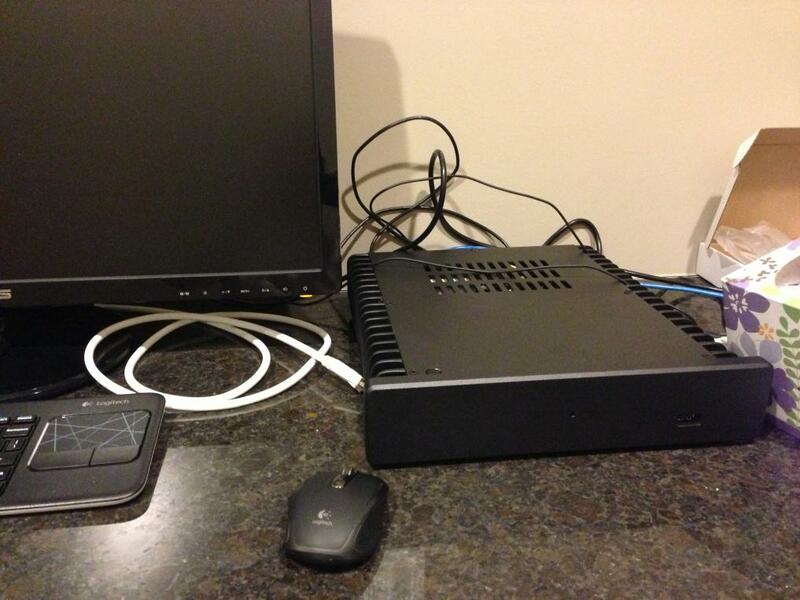 You can use an external power brick and a mSATA hard drive. 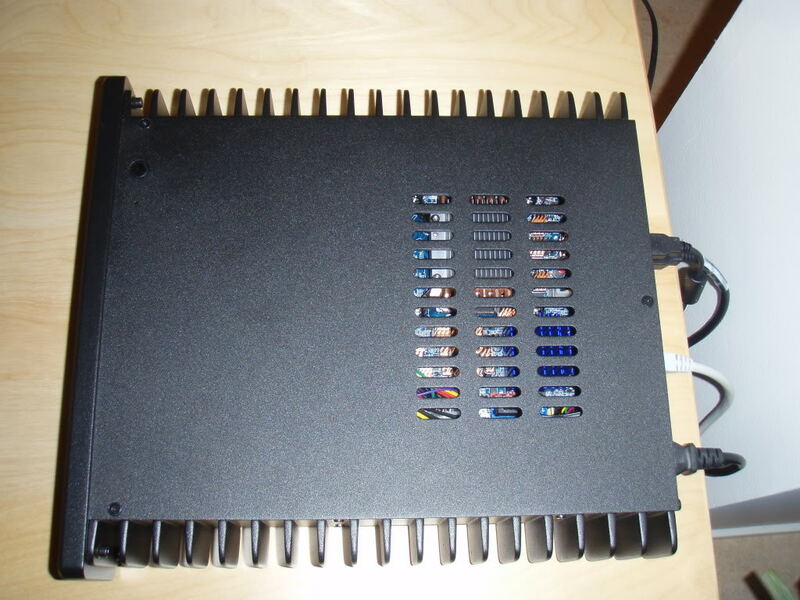 It is a pretty fast system – it feels very zippy but it is a new install and they tend to be better performing. Playing back 1080p video files only get the CPU up to about 8%. 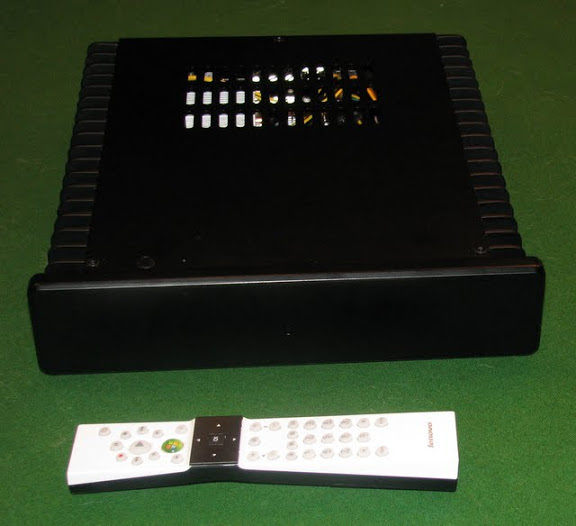 The system is usable in about 32 seconds from a power off state. The Windows Experience Index is 4.7 – the weakest link is the Desktop Graphics for Windows Aero. The CPU gets a score of 7.1. Is the 80W power suuply enough? After ordering the system I started to get a wee bit worried about power consumption as the CPU is supposed to draw a max of 65W so I was worried that the mobo+ SSD might put me over the 80W rating but that doesn’t seem to be an issue? Under no load the temperature reported is about 31 degrees. To really stress the system I ran Prime95 for several hours. The temperature started rising quickly and eventually got up to about 80 degrees. I don’t know that I would want to run the PC this hot all the time but even at this temp it seemed to be oeprating OK. I think I should be ok unless I use this PC to do lots of video reencoding that would really stress the PC. 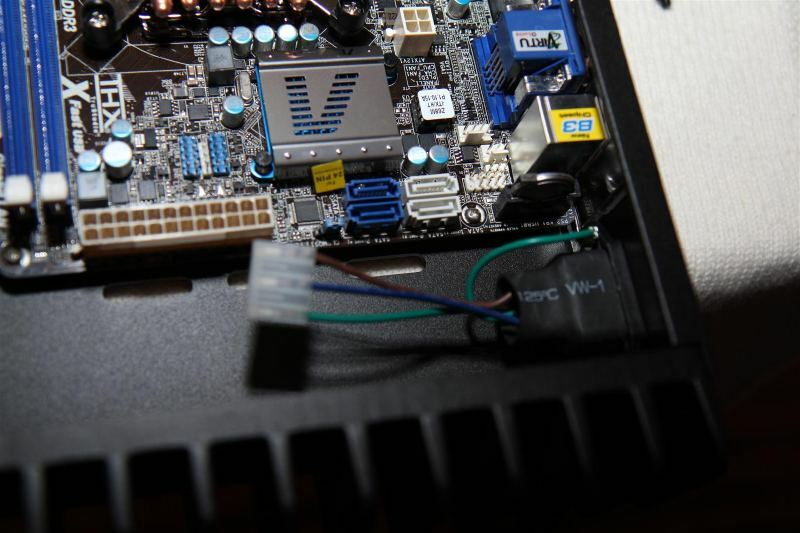 As you can see in the photos this mobo has built in Wifi via a mini PCIe card. I don’t need Wifi as I will have wired ethernet – therefore it might be fun to use this slot for an SSD instead. The only issue is that mSATA is becoming the standard for small form factor SSDs and it is not compatible with mini PCIe. You can buy specific mini PCIe hard drives as replacements for netbook drives so I may try that if I am feeling adventurous. 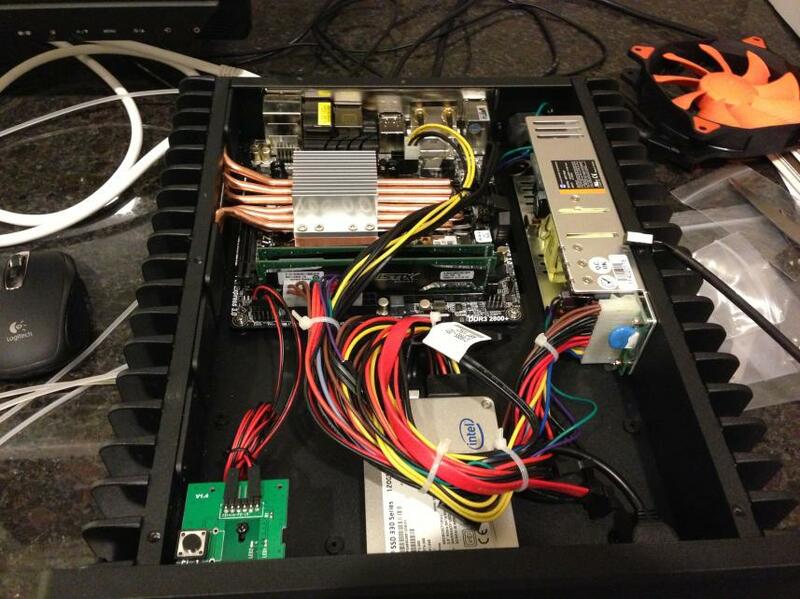 Note that Zotac now has a mini ITX mobo with a Z68 chipset that can use an mSATA device in the miniPCIe slot. Here is the look of the final assembly. The case gives a very clean look with only a small hole in the centre for the IR sensor. The switch is on the top left of the case and is very discreet. There are no annoying blue LEDs visible. I have included the remote control that came with the case in the photo but in its final place I will use a Harmony remote. Just wanted to share the details of my build and ask opinions about temperatures under stress. Win XP 32-bit (as I had it lying around). Might upgrade to Win 7 64-bit. This computer has to be 100% reliable as it will be doing mission critical data-logging and processing. So firstly I’ve basically left it at the un-overclocked standard settings, turned off any power settings and turned off the processor’s Turbo mode. So, the CPU temp seems okay. But how is this motherboard temp? I might also try reinstating some of the power saving features for idle time. 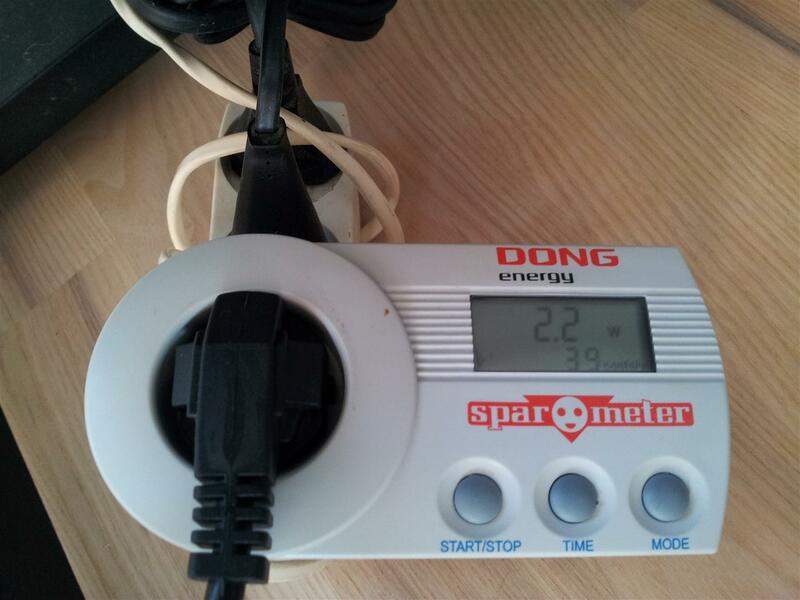 Okay, I’ve been doing some testing and my gut is that the 80W internal power supply might be insufficient. I was reading this post ( http://hdplex.com/forum/showpos…0&postcount=10 ) and see that a 35W TDP processor in a similar system to mind is asking for 42W during prime. Looking at the specs. of the 80W supply, it’s actually a 60W supply in this setup as there is no air cooling, and since my m/b was up at 60C we could be looking at around 46W maximum power output (60 x 0.975^10). And, of course, my processor is 65W TDP so could easily need an extra 10W or so juice under stress. Might be totally irrelevant, but also the 12V rail is quite low according to the BIOS at 11.6V. I’m trying an overnight Prime95 now with an ATX from another desktop, so let’s see if that crashes. The only problem is, I can’t close the case so the MB temp will be different. But if we’re stable in the morning, I guess I’m one step closer! 1. if i went with a fan-based case, knowing myself I would be unhappy and keep buying more expensive fans and fan controllers, so what seemed like a cheaper build gets more expensive. 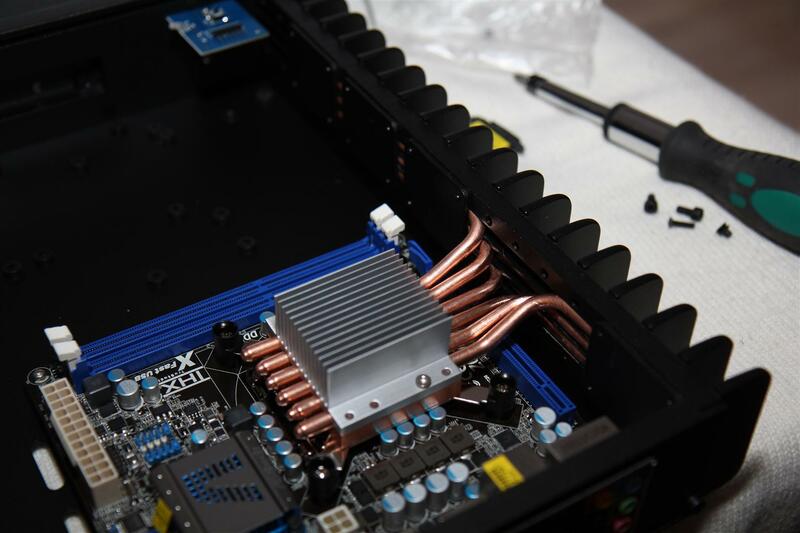 The build itself was interesting as you have to install the copper heatpipes and connect them to both the cpu heatsink block and the side of the case. If I had any comments for hdplex I would say that they need to standardize their documentation: I got two different manuals with the case, and the manual on their website is different from either of those two. While building, the different manuals went into varying detail about the installation, so I basically had to toggle between the 3 manuals to get the best idea of what I was doing. 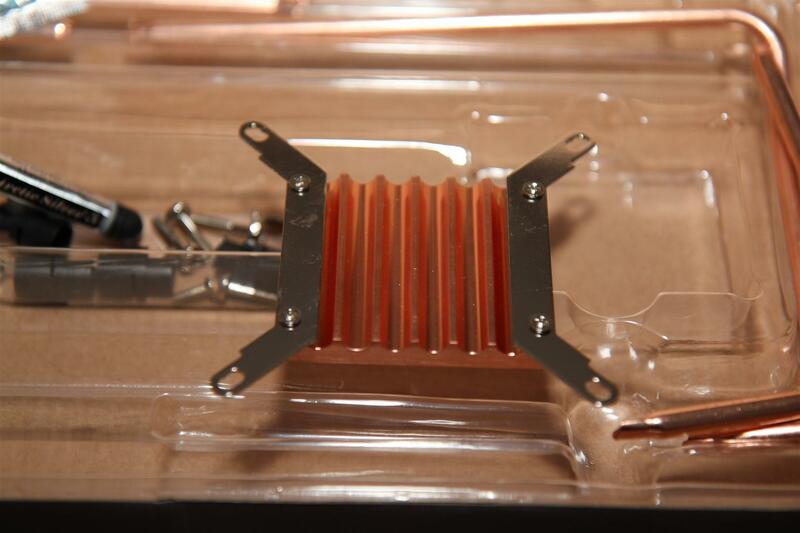 I would also recommend to anyone that uses this case that when you install the copper heatpipes, don’t fully tighten any screws related to that process until everything is generally in place (i.e. 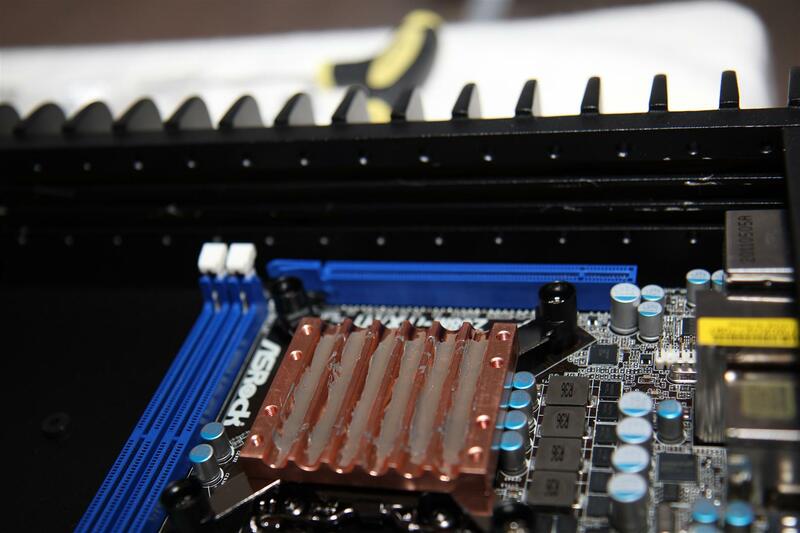 all the pipes are pushed in to the side of the case and the aluminum heatsink is clamped gently to the heatsink base. The copper is maleable enough that you want to jiggle things into place as you go around and tighten the screws fully. I’m running an i3-2125 and my most taxing task for this build is going to be video palyback, so temperatures stay in the 30-45C range, which is pretty good in my opinion. Overall I’m a big fan of this case and will keep an eye on their future products. HDplex sells larger cases as well that would be easier to fit expansion cards into without modification. I gave up on mythbuntu because there are some unresolved issues with sandy bridge integrated graphics and screen tearing. I experienced screen tearing and pauses while streaming from my NAS. Last night I installed Windows 7 and had the whole thing set up in 20 minutes, video quality is excellent and streaming video is glitch-free. 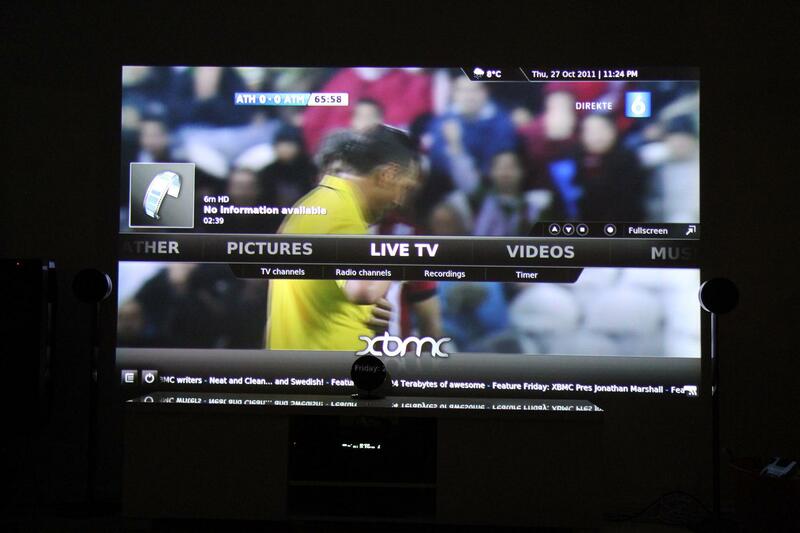 I am also able to stream hd tv from an hdhomerun over a wireless n network. Temperatures in a 20C room were ~40C and didn’t seem to fluctuate very much between idle and video playback. I haven’t run any stress tests on the machine as it will never do anything more stressful than play videos. First of all, I want to thank Larry for the help and fast shipping (I am based in US). I have previously set up a H5.S machine in July, so I am reasonably familiar with the installation process. Setting up this new H3.S machine has been a breeze. Very easy and fast. 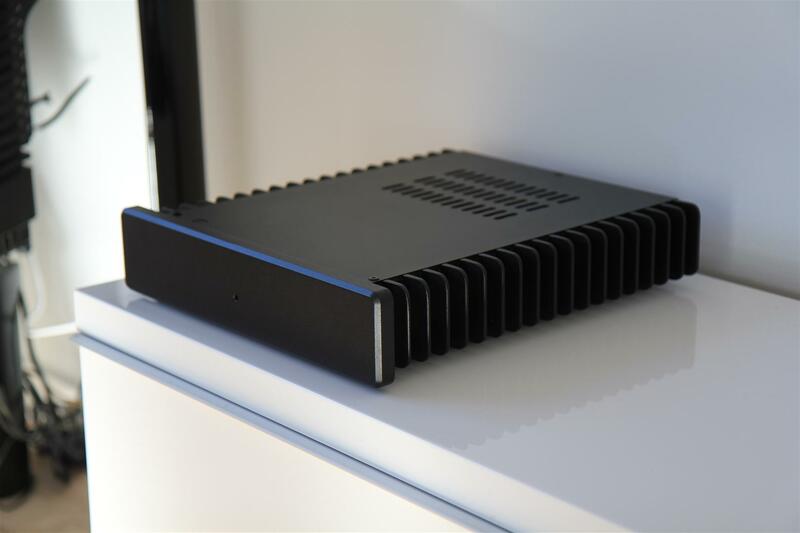 I have to say I am really impressed by HD-PLEX’s case design–modular (H3 and H5 share a lot of common designs), consistent, effective (my H5.s has not had any heat-related throttling), and ecnomoical. Comparing this H3.S to my previous AOpen DEX4501, it is 50% larger in length and width, but 100% more CPU cores (4 versus 2), and most importantly, fanless without compromise (DEX4501 throttles a P9600 easily). The main reason for 2405s instead of 2500t is HD 3000 versus 2000 graphics. The 3000 has double the execution engines of 2000, which is particularly useful for transcoding. I have also used 2405s in a H5.S and had never had heat issues. I will do a stress test of the H3.S tonight and see if there is any heat problem. My goal was to choose the fastest CPU with HD 3000 graphics and no heat issue. If one do not care about the HD 3000 graphics, 2600s should be the best choice at 65Watt (4 core 8 HT) while 2500T is the best for 45Watt. I did the prime95 maximum heat test today with both the H3.S and H5.S (both with H67 and 2405s and 8GB). So GPU is minimally used during the test. During the initial test I found the H3.S to be slightly hotter than H5.S, and both seems to be only able to sustain the 4-core prime95 maximum heat test without throttling under stock speed for say, 15 minutes or less. I then realized that I forgot to apply the thermal paste to the side of the cases where the heat pipes stay. 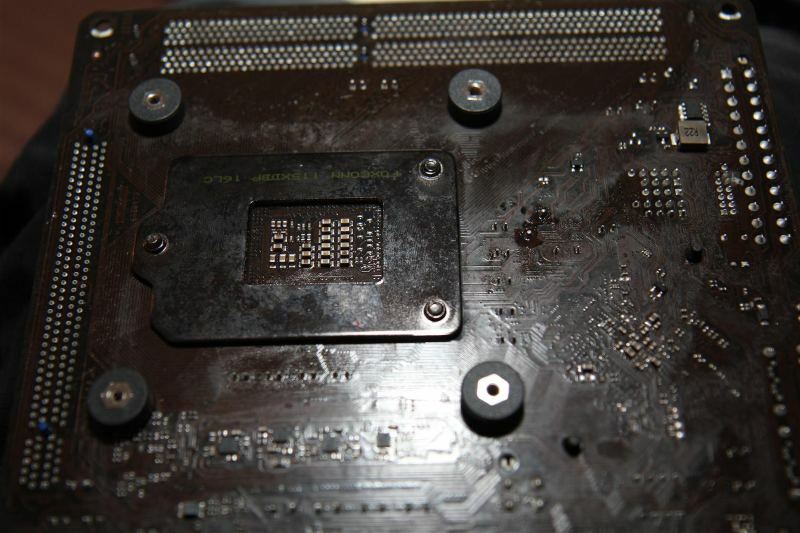 I opened H5.S and applied the paste to it. After that, H5.S was able to sustain 40+ minutes before the throttling finally kicked in (when the CPU temp is 70C). Granted, this is a special test that probably does not reflect normal usage, at least for me. I noticed during the test 2405s is using 36~37 Watts (mostly by the CPU part) when fully loaded at stock speed and 40 watts when on auto-turbo. I might open H3.S and apply thermal paste tomorrow but expect the same improvement as H5.S have had. it was measured that 2500T’s full CPU load wattage as around 37 (I assume it is on auto turbo), which is very close to the 40 number for 2405s as I measured. This makes wonder if changing to 2500T would improve the maximum heat test scenario much. I am running a small IT-company and we recently moved into a new office which is one beautiful open corner compartment. 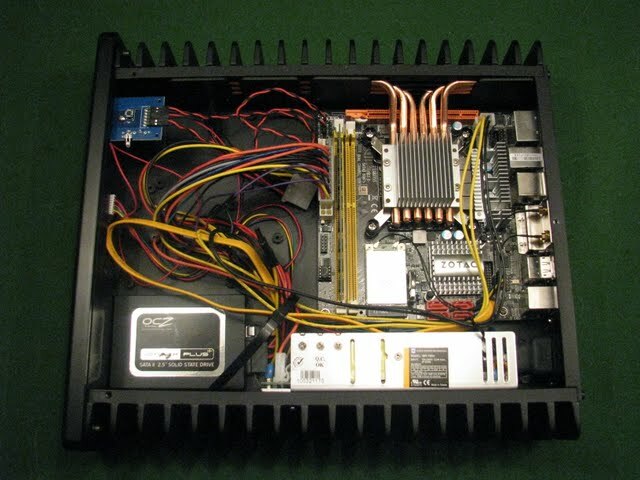 In order to avoid disturbing noise from the computers, I ordered four passively cooled H3.S computer cases from HD-Plex (www.hd-plex.com) and built completely silent office PC:s which have no moving parts. 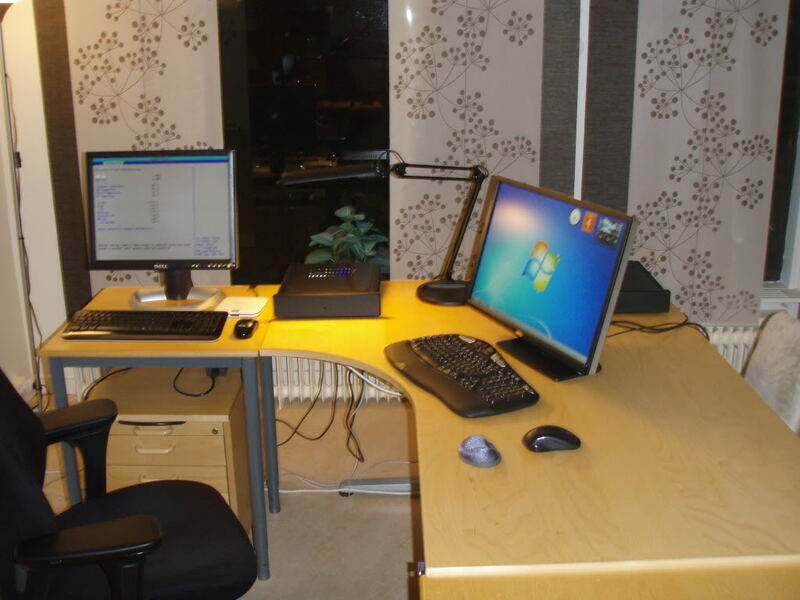 As you can see from the pictures below, those are small computers (325 x 298 x 60 mm) which fit easily on the desktop. 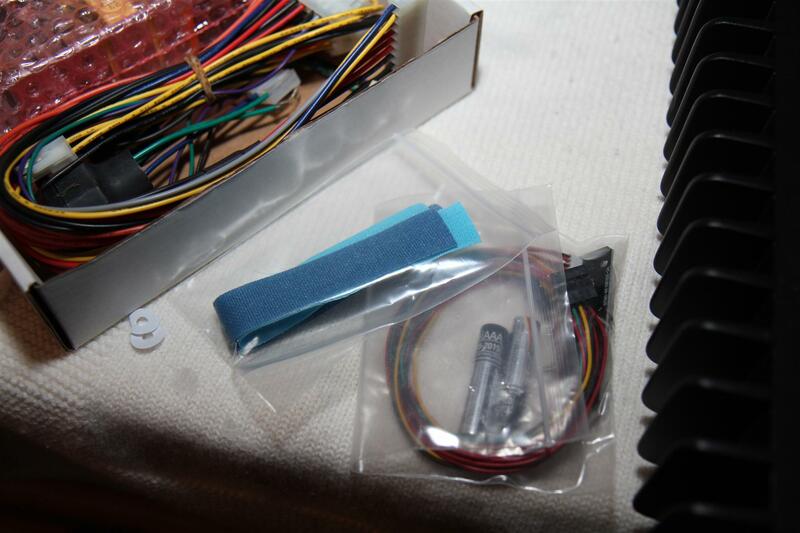 The version of H3.S that we use does not have any front USB-port, although later versions will have this. However, this is not an issue for us since all our monitors have USB-hubs. 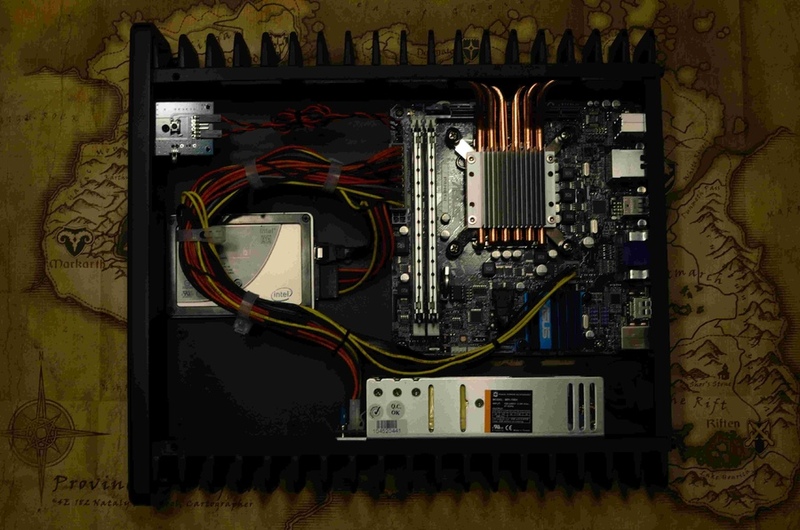 Apart from the H3.S case, we use standard desktop components which are relatively inexpensive and easy to find. If we need more computers to our office, we could use the same configuration again which would save us some time. For the SSD, our priority was reliability rather than maximum speed and we were willing to pay a bit extra for an Intel product. The H3.S case is sturdy built with a minimalistic design which appeals at least to my sense of aesthetics. The black aluminium has a powder finish which does not leave any fingerprints. The cooling fins on the side are nicely rounded. 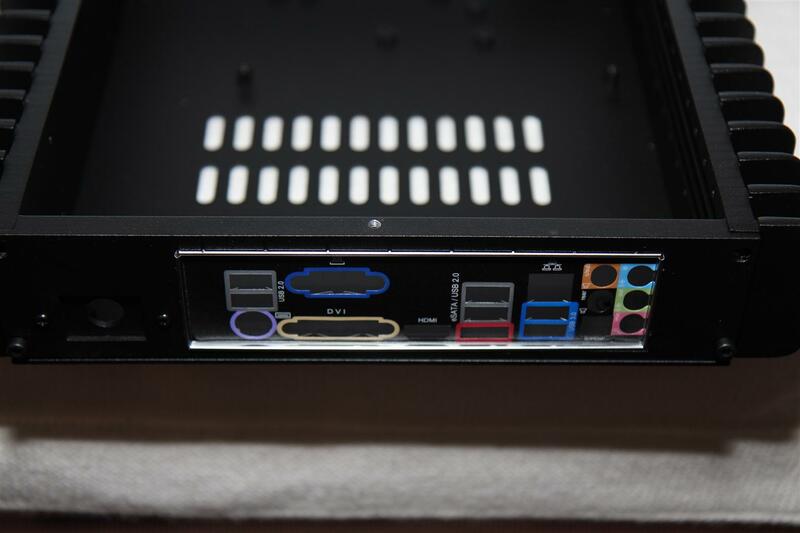 To the back of the case, the lid is attached with one screw in the middle but no screws in the corners. This means that the lid does not fit as tight to the case on the sides as I would ideally have liked it to do. Apart from that small detail, the case really looks great. 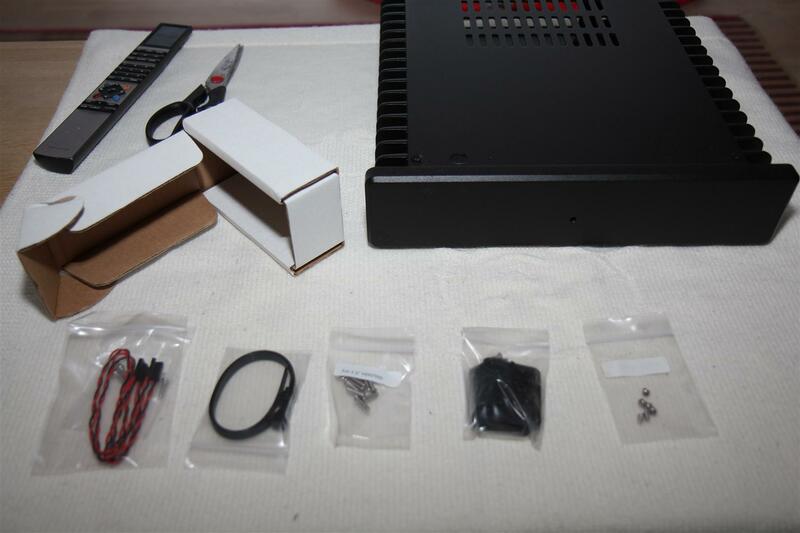 The H3.S case arrived with neat packaging and good instructions for assembly of HD-Plex cases in general. 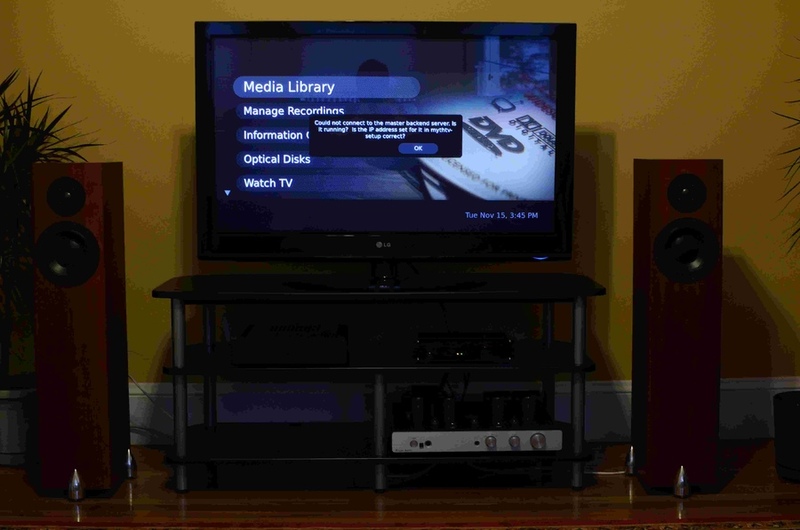 I also downloaded complimentary instructions specifically for the H3 series from the HD-Plex website, which helped clarify some installation steps. This worked just fine, even if I would ideally have preferred one manual with all the instructions for this specific model. 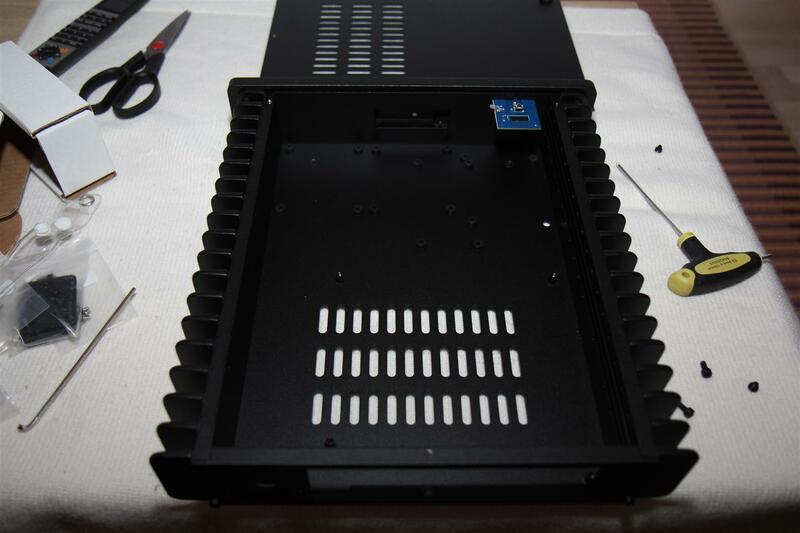 Inside the case, everything is well planned. 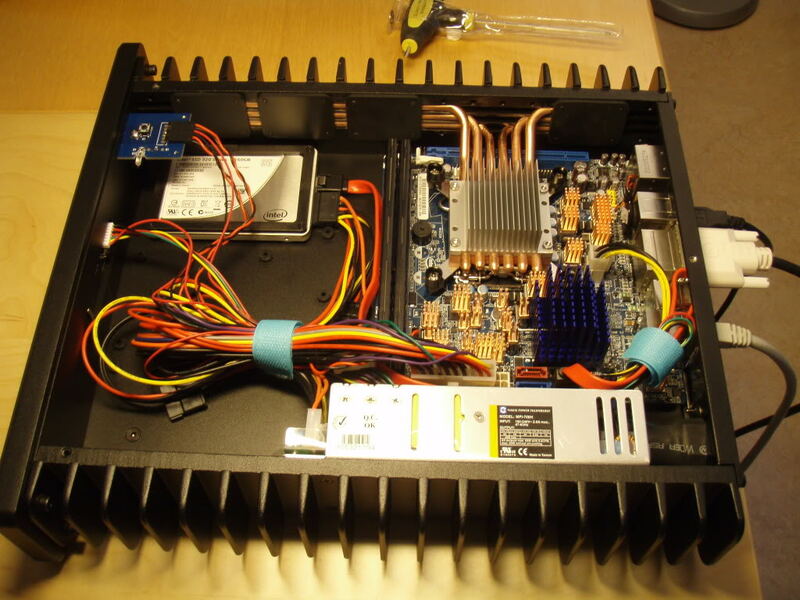 Despite the small form factor, it would still be easy to securely install a second or even a third SSD. I should mention that the Intel DH67CF motherboard that we use has small components on its back side which conflict with the bottom holders of the CPU-heatsink. However this is rather easily solved by cutting the holders a bit with a knife to make them clear the obstacles. 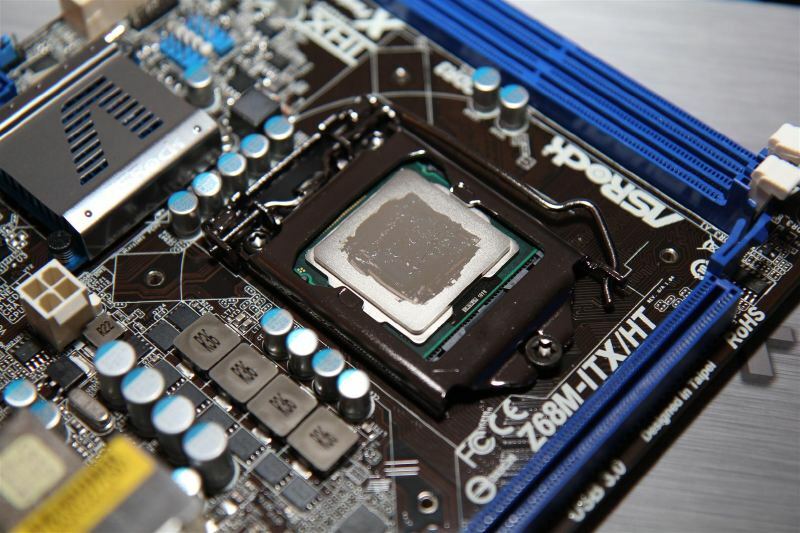 Applying thermal paste properly for the CPU-cooling does take some time but it is worth the effort. Also the included “barbell” tool helped a lot. As you can see, cable management is not a problem. Initially, I installed 8 Gb RAM (2 x 4 Gb low profile) which you can see in the picture below. Later I have upgraded all four computers to 16 Gb (2 x 8 Gb) which is the maximum supported by the motherboard. Please note that the full size Corsair Vengeance RAM modules that I used have heatsinks which turned out not fit into the H3.S case. 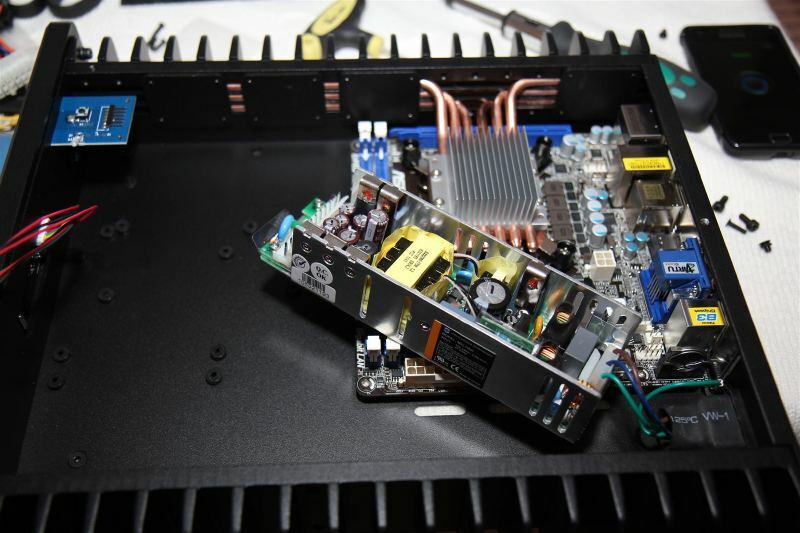 However, the heatsinks are rather easily removed. I put Koolance heatsinks on the RAM modules as a replacement, but that is probably not necessary. 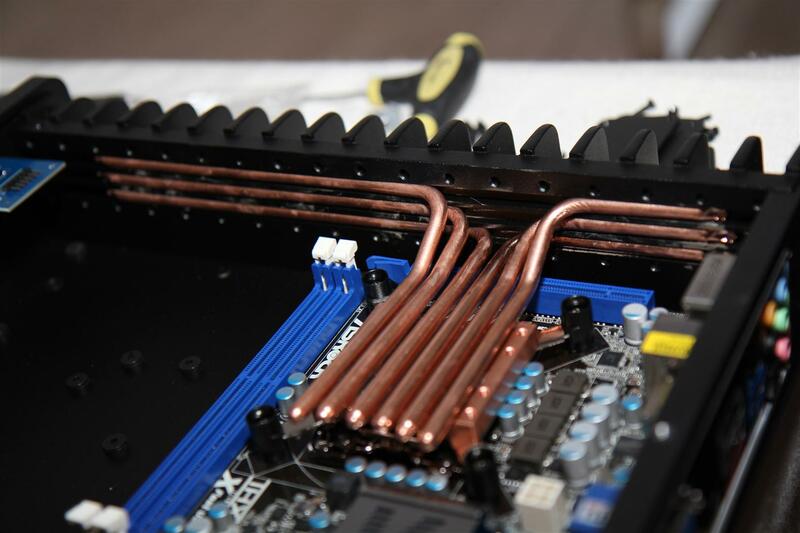 The H3.S has a six heatpipe CPU cooling system which transfers the heat to the cooling fins on the side of the case. 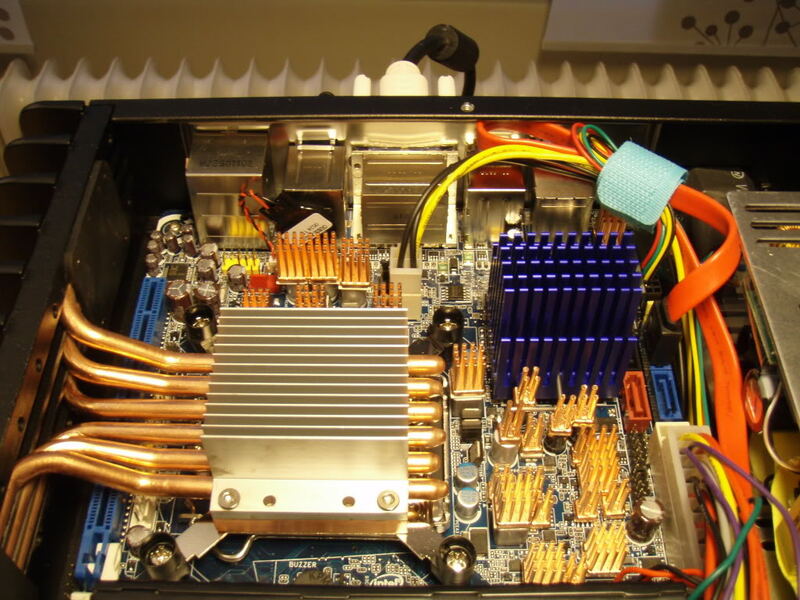 There is also a heatsink on the inside. The maximum recommended TDP for the processor is 65W which means that H3.S works with any Intel Core i3-21XX processor as well as with the low voltage quad-core processors in the Sandy Bridge series. 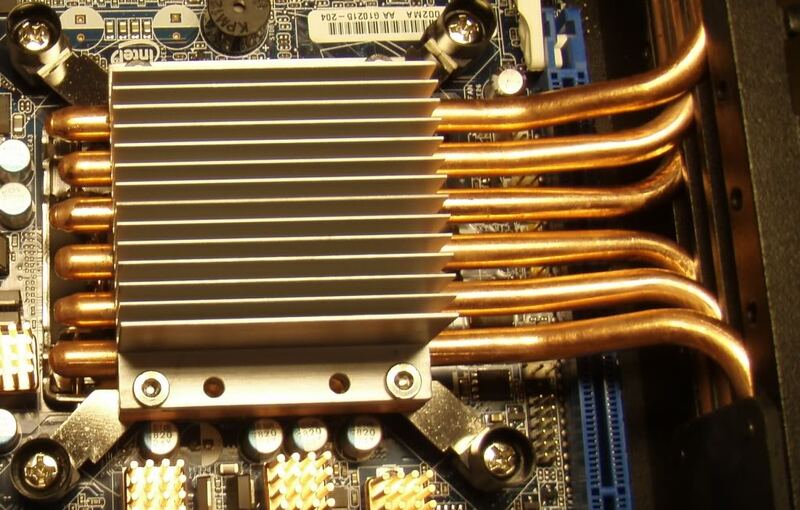 When Ivy Bridge arrives from Intel, it will be possible to use even more powerful processors with this cooling solution. At that point, I might consider upgrading our development server to a Core i7-3770T which will be TDP 45W. 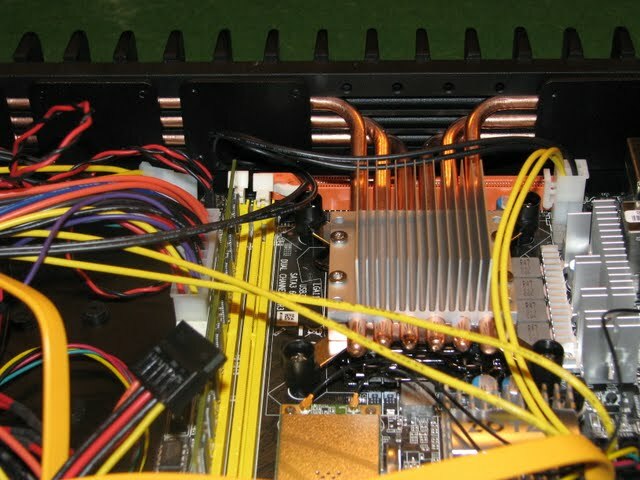 Since the CPU-heatpipes cross over the PCI-express slot of the motherboard, there is no place for discrete graphics. This of course makes sense for a case without fans. However it means that if you want to run resolutions above 1920×1200 pixels, then you need a motherboard with either Displayport or dual-DVI. Most Mini-ITX motherboards do not have this. 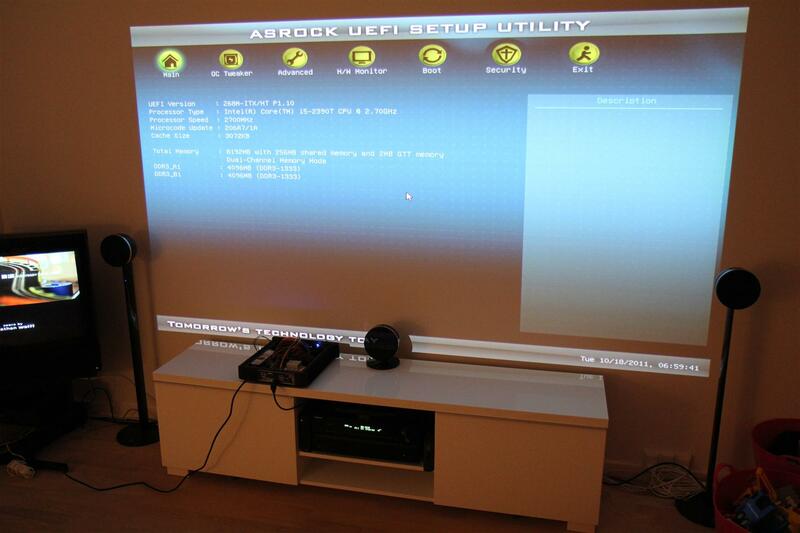 For an HTPC typically running 1080p, this is not an issue. However, our workstations must be able to run 76 cm monitors with 2560×1600 native resolution like the Dell U3011 that I use myself. 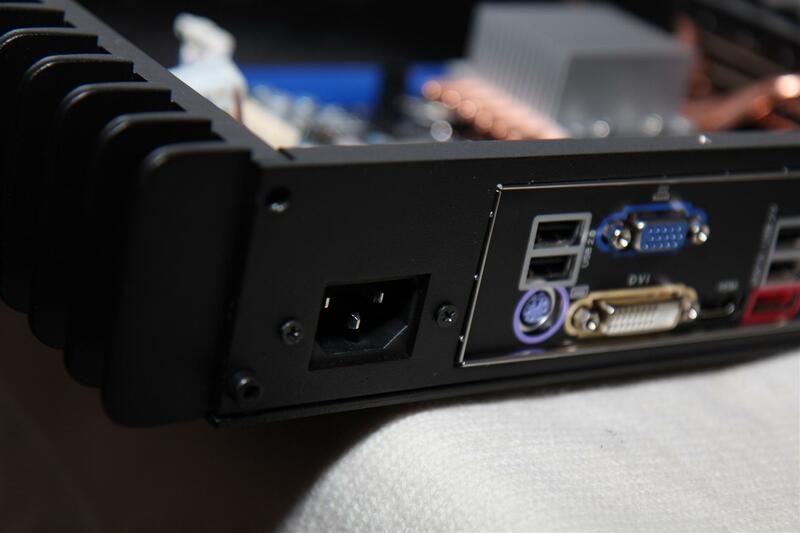 This means that connectivity can be an important aspect when you decide on which motherboard to use with the H3.S case. 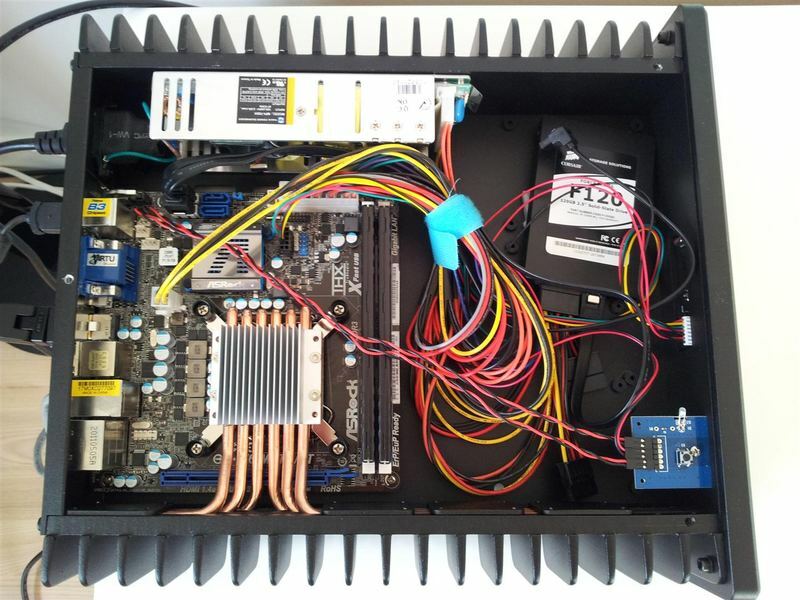 The built-in passively cooled 80W PSU fits well into the case and is easy to install. 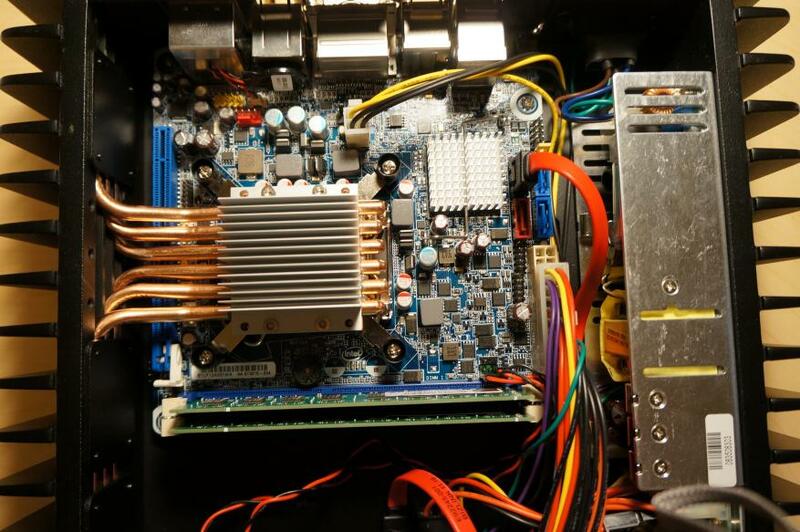 It also does not get very hot under load thanks to its cooling from the fins on the side of the case. I was initially a bit worried by the 12V level on one of our computers sometimes dropping as low as 11,35V. The lower safe limit of the motherboard is 11,10V. However, we have not experienced any instability issues so obviously the voltage still always stays on the safe side. 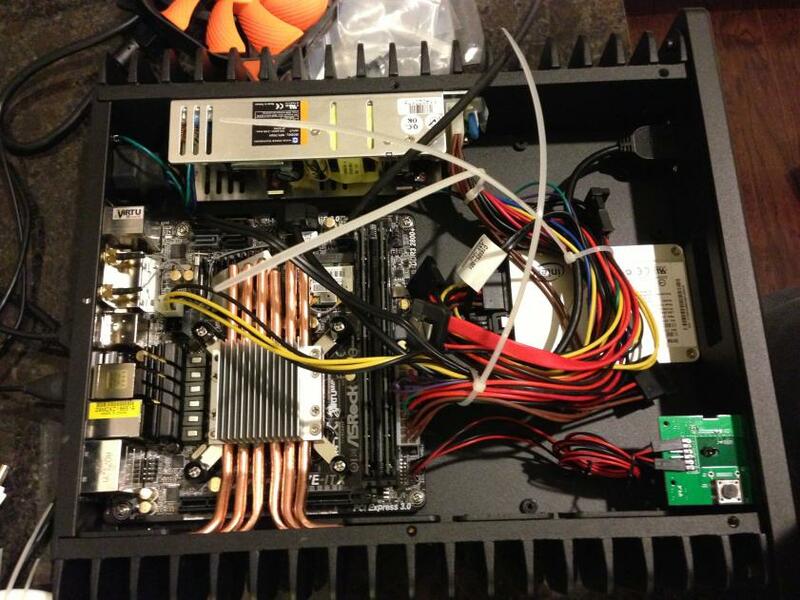 The H3.S case provides cooling for the CPU and the PSU, but not for the motherboard. 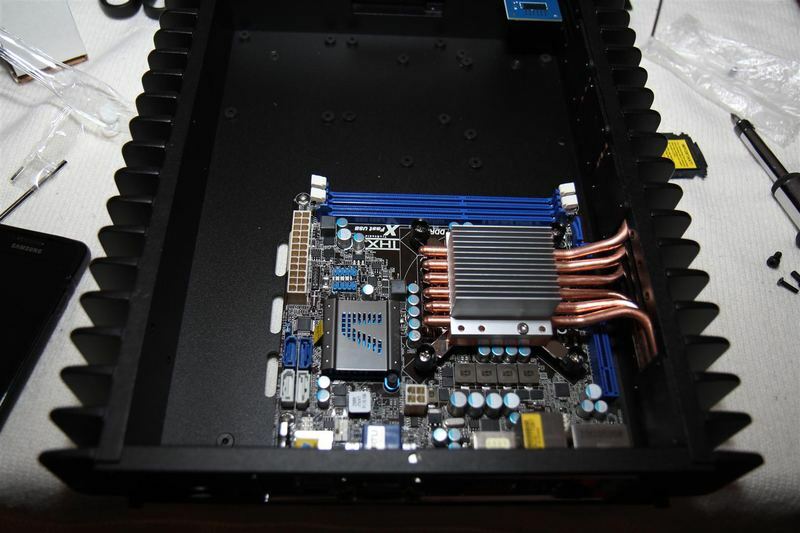 This is probably a wise design choice since it would be difficult to fit all motherboard components anyway. Also, convection cooling works well in the horizontal case with openings both above and underneath the motherboard which let the air pass. 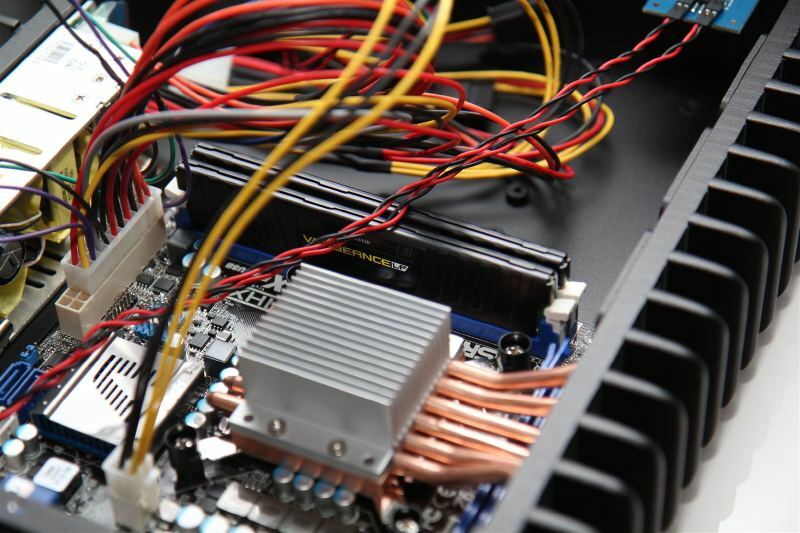 However, if you plan to use your computer under heavy load, you do need substantial heatsinks on the motherboard in order to get enough convection cooling to keep all components within safe temperatures. 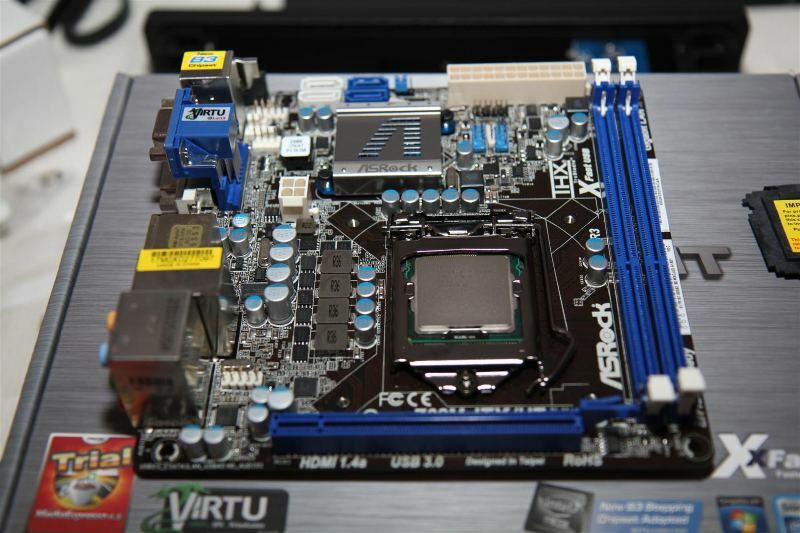 The Intel DH67CF motherboard is one of the rather few Mini-ITX boards which have the Displayport we need. It is also very energy‑efficient and thus creates only small amounts of heat. However, coming out of the box it only has a small chipset heatsink and no cooling at all for the rest of the motherboard components (notably the Voltage Regulation). It was clearly not designed for a case without fans. 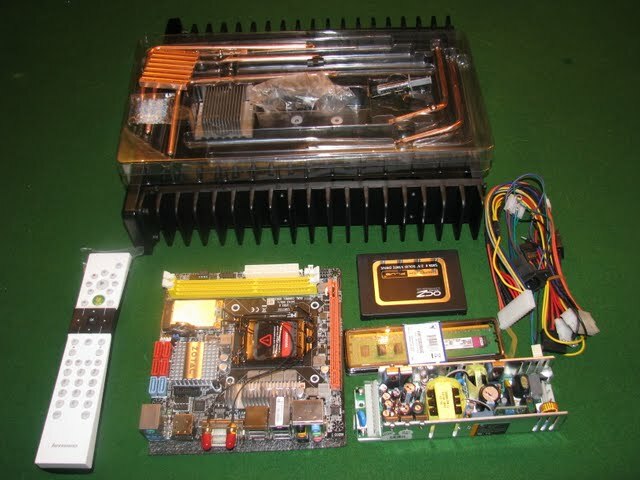 This might still work for an HTPC, but not for a workstation which will sometimes be under heavy load for long periods of time and where stability is crucial. 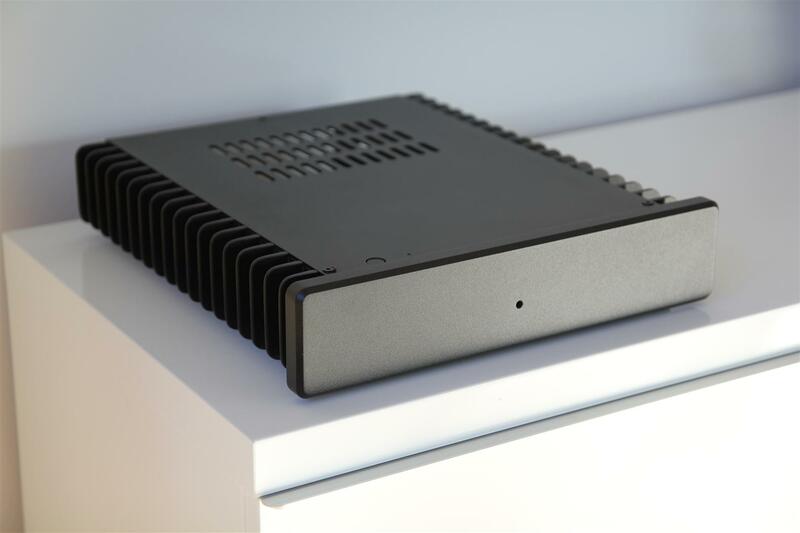 Luckily, the H3.S case has just enough space for the efficient and inexpensive Zalman NB47J northbridge heatsink which is also compatible with our Intel motherboard. 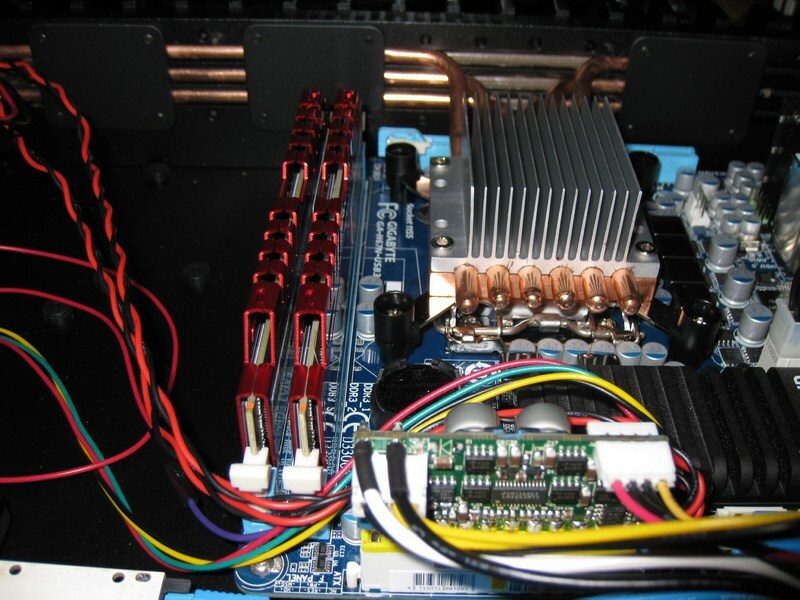 That replacement of the stock heatsink brings the chipset temperatures under load down by at least 20-25C to reach comfortable levels. 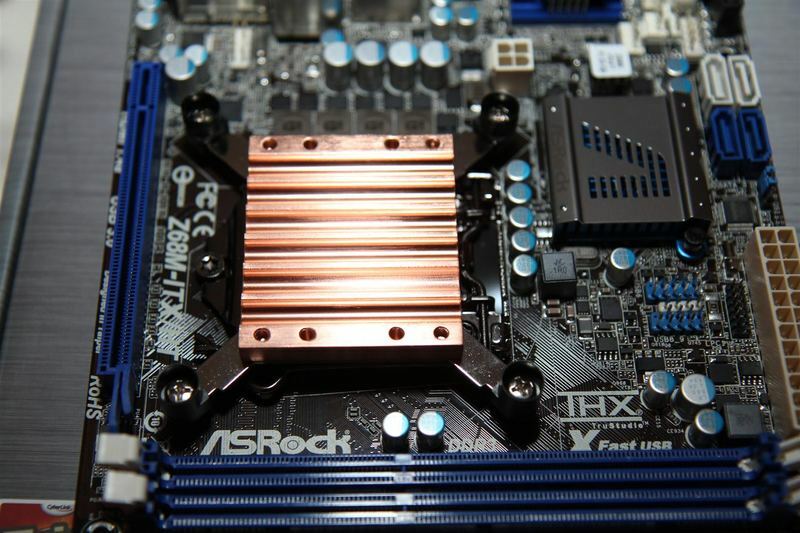 For the other motherboard components that tend to get hot, I used small copper heatsinks from Enzotech (MOS-C1 and MOS-C10) which are easy to attach where you need them. With the resulting “heatsink forest”, we feel safe that the motherboards in our silent computers will not overheat. Note however that we use some of our computers under heavy loads (development server, parallell OS in virtualization etc.) and that regular office computers for lighter loads should not require this amount of heatsinks. I should also mention that if you do not need DisplayPort, you could make an easier choice of motherboard like the Asus P8H67 Deluxe which has excellent stock cooling for all components so you do not have to add any heatsinks. Just keep in mind that you need to use SO-DIMM RAM for that Asus motherboard. I tested our computers under rather heavy loads for a long time. In all cases the temperatures stayed at safe levels by a wide margin. 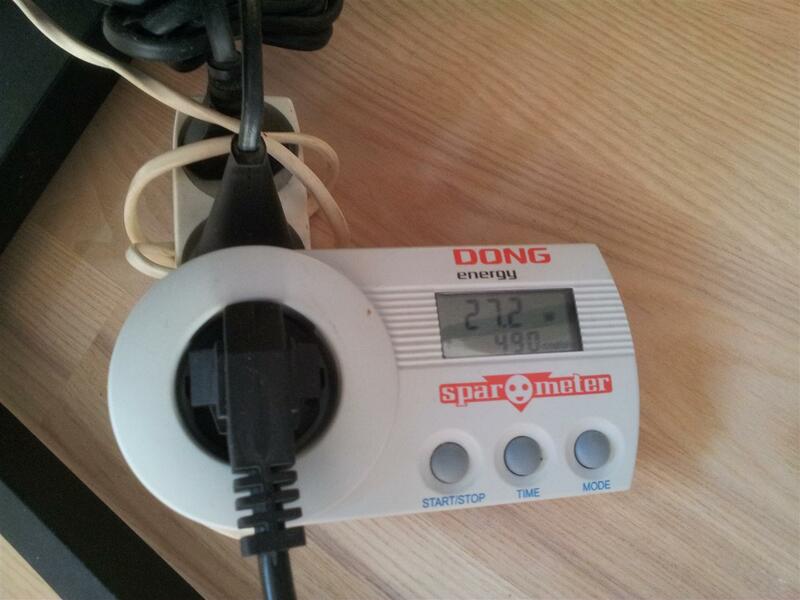 I have no measurements for the PSU, but subjectively it did not feel very hot to touch. 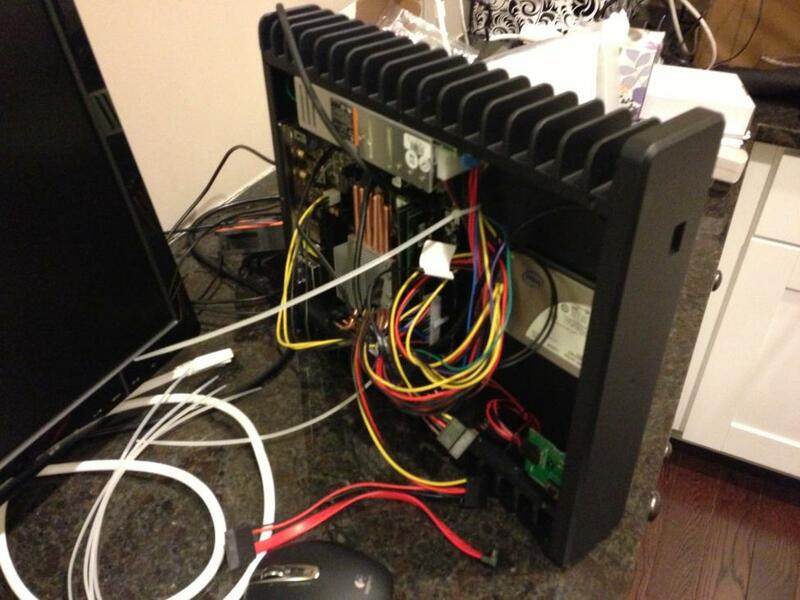 Also, the fins on the PSU-side of the case were clearly not as warm as those on the CPU-side. 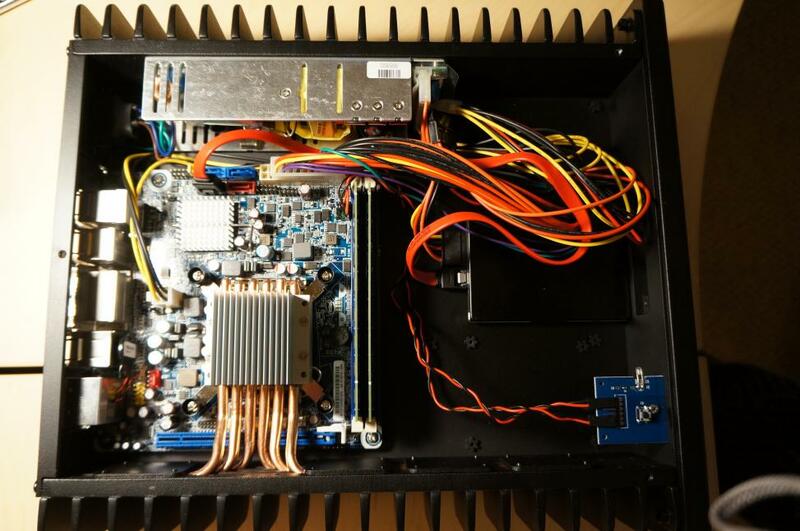 The most critical measurement was the temperature for our 65W processor under long term load. The highest temperature I observed was 61C. That is a great result for a passively cooled case. Larry at HD-Plex provided me with excellent service, giving quick and accurate responses on my questions sent by email both before and after my order. This was actually remarkable when taking into account the time difference between Sweden and the USA. 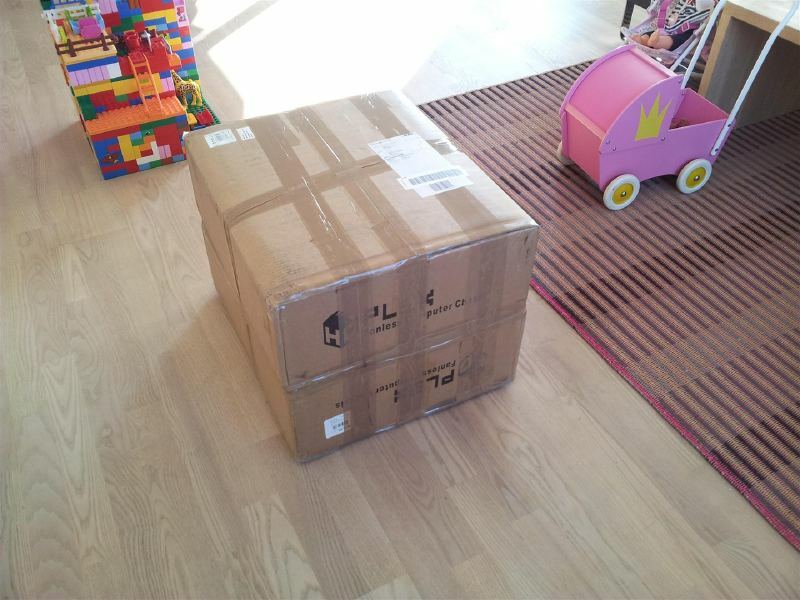 Also, the logistics worked well and my four cases arrived to Stockholm within reasonable time. 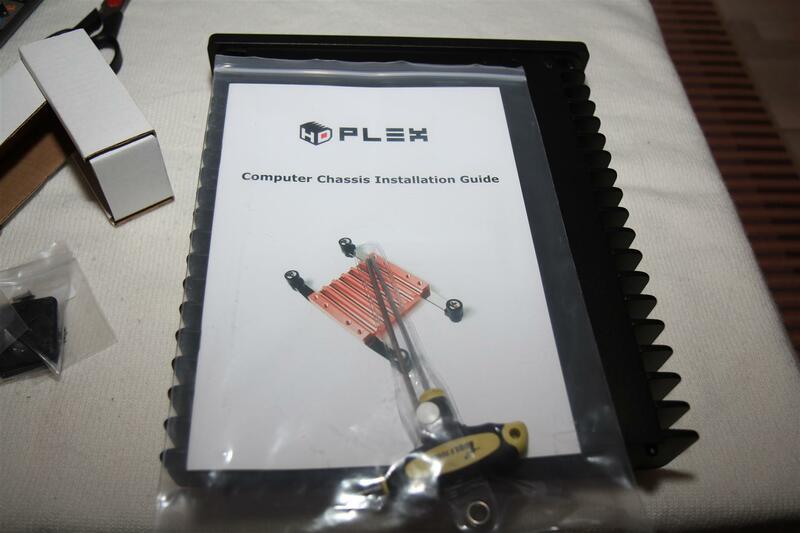 HD‑Plex ship their products to European customers from Germany which shortens the delivery time. I get some sort of magic feeling when I push the power button of my H3.S computer and there is not the slightest sound to be heard as it starts and boots to Windows in less than 20 seconds. 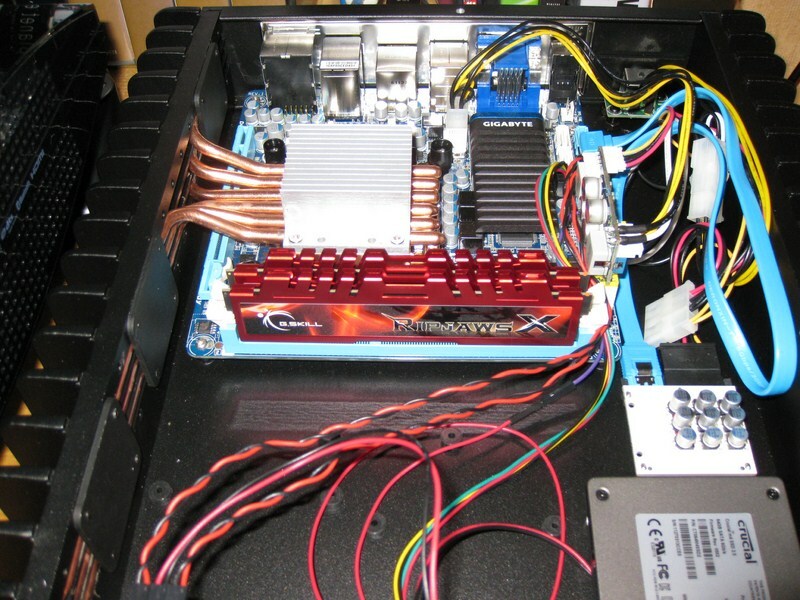 Granted, there are other computer cases which can give you complete silence if you use a processor with a very low TDP. Also, my own gaming computer at home is inaudible in a normal room but that requires an enormous HAF-X case with seven large fans. 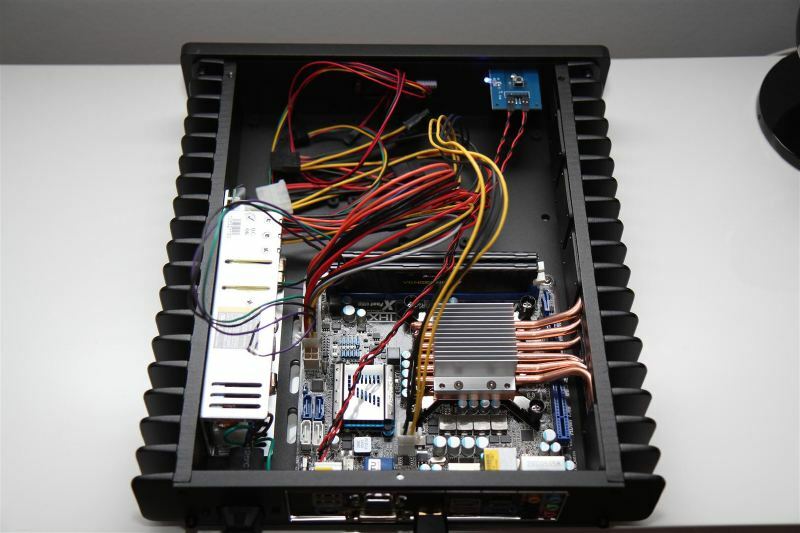 The H3.S case is able to run a 65W processor completely silently and still cool under load. It is also an elegant and practical case which saves a lot of space in our office. Further, it has no moving parts which collect dust and wear down over time. 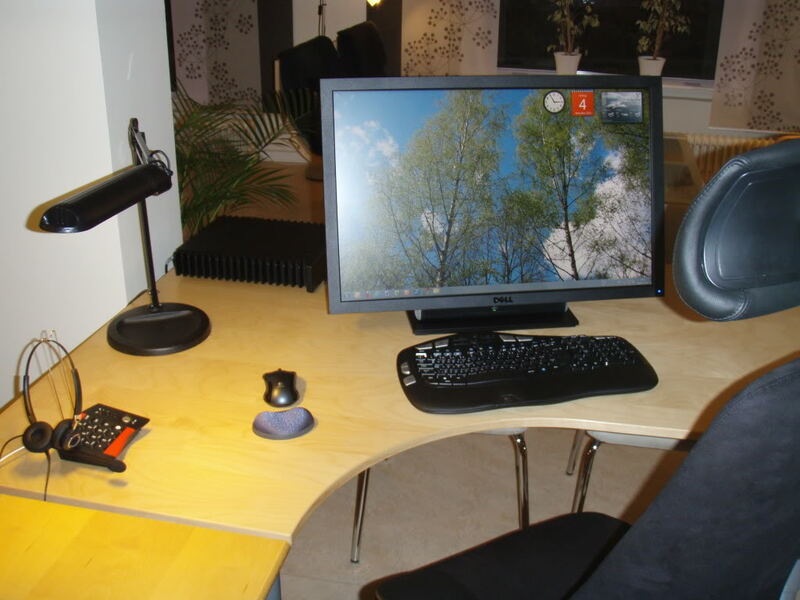 On top of this, the computers can be built with standard desktop components which means that the cost is kept down. 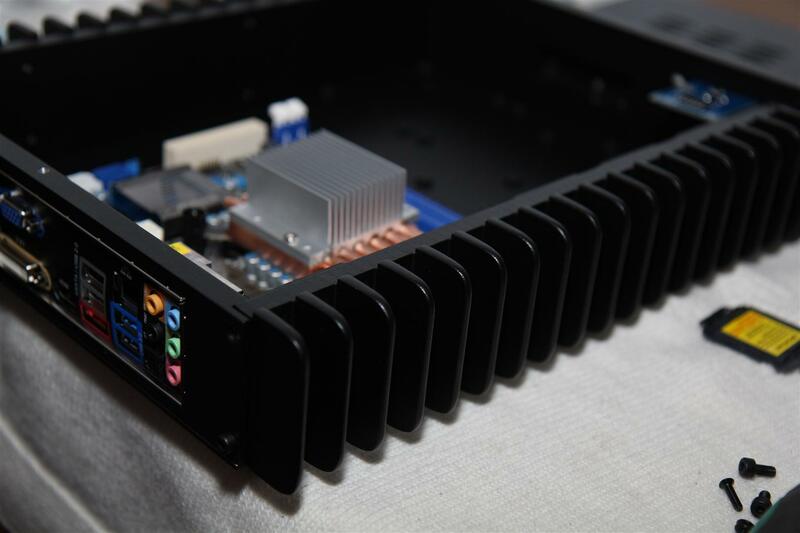 The H3.S case from HD-Plex is a great product with very efficient CPU‑cooling, stylish design and a high build quality. I strongly recommend it to anybody who wants a completely silent and still fast computer at a reasonable cost.